From Beast Kingdom. Beast Kingdom Toys is proud to announce the Egg Attack EA-011 Avengers 2: Age of Ultron War Machine! 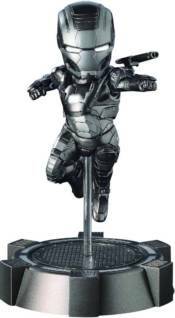 Staying true to the movie's settings, the statue features a special blend of unique metallic black paint to show War Machine's iconic look. Details for the face, abdomen, back armor, and shoulder canon are recreated perfectly, with LED lighting embedded in the eyes, chest arc reactor, feet jet engines and base. Once the LED lights are turned on, it will be just like in Avengers: Age of Ultron!